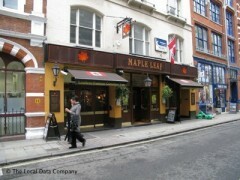 About: The Maple Leaf is a pub with a Canadian theme to it. With its maple wood furnishings, maple leaf flags and a traditional English and Canadian menu, you may be mistaken for thinking that you were in Canada. It boasts a multi-screen TV complex which more often than not shows coverage of sporting events from Toronto. Being a Canadian venue it stands to reason they’d serve the country’s most famous dish. Here they have no less than eight different versions, including the Mexican with guacamole and salsa, the British with pulled pork and peppercorn sauce, and the veggie option with peas, mushrooms and red onions.